Is it possible that the changes made to turn autocomplete=off on the composer text area have broken predictive text input for users? 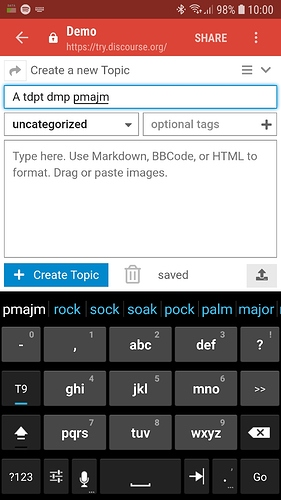 Since upgrading last week I’ve had a number of users pointing out that predictive text no longer works for them on Android mobile via Chrome or stock browsers and using stock keyboard or other keyboards. It looks like this happened around the same time as autocomplete was turned off in 2.2. I know this was done for another reason but just wondering if it could have caused this problem now or if it’s unrelated. This also appears to be happening on try.discourse.org. I can’t verify myself without an Android device but one of my users tested it there and predictive text changes are no longer kicking in. I just tried in iOS and Android and autocomplete works as expected (i.e., I type yhis and it corrects to this automatically). Predictive suggestions still appear normally above my keyboard. Is it only the T9 style predictive input that’s broken (as per the screenshot)? I can’t add any detail here (happy to research it if needed) but I had a user report this too. I rather glibly told him that Discourse wouldn’t impact his Android keyboard behaviour but now I see another report I’m wondering if there’s something in it. Let me know if you need more details.